A trade show is an ideal opportunity to get your products in front of industry leaders. By bringing your company to a trade show, you’ll have the opportunity to create new connections and ultimately introduce your brand to a much wider audience. Unfortunately, managing trade show logistics is complicated. From figuring out how to warehouse your goods to ensuring that your booth is delivered on time, there are many factors that must be carefully considered. Luckily, with the help of an experienced trade show logistics provider along with a few simple tips, your trade show is sure to be a success! Wouldn’t it be easier if you could pass the hassle of trade show logistics on to someone else? With AFP Expo, you can! Because trade show logistics are so complicated, it pays off to enlist the help of experts. AFP Expo has extensive experience managing every aspect of trade show logistics. We can safely deliver any trade booth display, no matter how delicate or complex, and we will ensure that it arrives on time and intact. 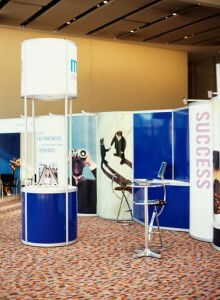 After all, there is no way your booth will be successful if it’s delivered long after the event has ended. Freebies are a great way to entice people to visit your booth. Branded products such as pens or water bottles are also an effective way to keep your company’s name on consumer’s minds after the event has ended. Even if you do not want to go through the effort of providing free promotional products, a jar of candy or a platter of cookies can go a long way in encouraging more visitors to stop by your booth. The people who work your booth are just as important as the booth itself, so be sure to choose wisely. You should assign staff members to work at your show only if they are experienced with your business, understand it inside and out, and enjoy interacting with new people. By covering these bases, you’ll be well on your way to trade show success! For more information or to start designing your own logistic solutions today, get in touch with AFP at 410.590.1234 (toll-free 800.274.1237), email us at expo@afplus.com, or fill out our quick and easy contact form here! This entry was posted on Thursday, April 14th, 2016	at 9:17 am	and is filed under Trade Shows	. You can follow any responses to this entry through the RSS 2.0	feed. Both comments and pings are currently closed.